Legacy at The Village of Fox Meadow in Newark, Delaware is a premier 55+ community that will have 194 homes upon completion. The community offers choices for all lifestyles: townhomes, carriage homes, and single-family homes. Residents of Legacy at The Village of Fox Meadow enjoy beautiful wooded views from their luxurious, quality-built homes. 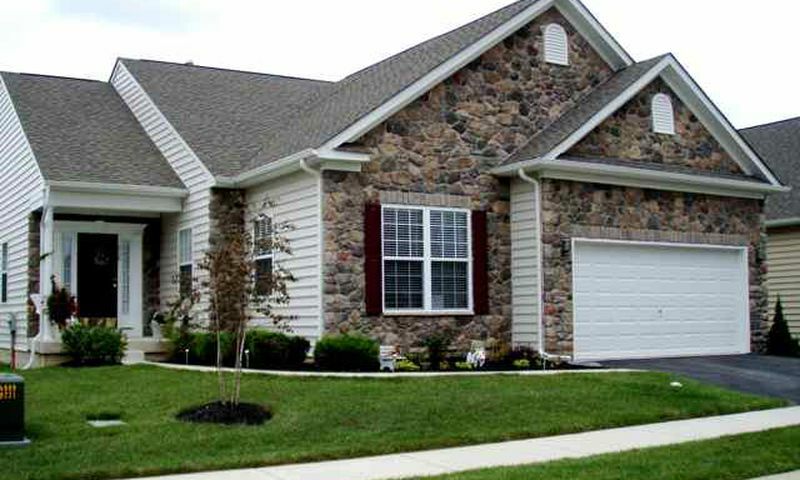 This Delaware active adult community is conveniently located near major roadways and is only minutes away from shopping and dining opportunities. Not only do residents enjoy easy shopping, but the state's tax benefits as well. In addition, the enjoyable four-season climate makes Legacy at The Village of Fox Meadow at Newark a great choice for active retirees who want to remain close to family and friends along the Mid-Atlantic region. A charming community clubhouse at Legacy at The Village of Fox Meadow serves as a small gathering space for community events. This 3,000 square-foot clubhouse is a wonderful place to host a holiday party or meet friends for a game of cards. Throughout the area you will find parks and natural space for nature lovers. Construction of Legacy at The Village of Fox Meadow began in 2008 by Gemcraft Homes, it was later acquired by Ryan Homes in 2012. Ryan Homes will complete the buildout of this community. Upon completion, Legacy at The Village of Fox Meadow will have 194 residences. Homes are available in three styles - townhomes, twin homes and single-family homes. Each builder at Legacy offers different levels of included features. Many residences have a variety of energy-efficient features such as insulated basements, 90 percent efficient natural gas furnaces, 13-Seer central air, programmable thermostats, and quick recovery natural gas water heaters. Ryan Homes offers new construction townhomes and single-family homes. There are two attached townhome floor plans that have between 1,676 and 2,023 square feet of living space. Most townhomes by Ryan Homes have three bedrooms, two-and-a-half bathroms, and an attached one or two-car garage. Ryan Homes' single-family models range from 1,406 to 2,300 square feet in size. Single-family homes are great options for larger yet more private residences that include three bedrooms, two to three-and-a-half bathrooms, and an attached two-car garage. There are also a selection of previously owned homes that were built by Gemcroft Homes. Gemcroft's attached twin homes are duplex residences that have between 2,180 and 3,164 square feet. These were built with three to four bedrooms, a den, three-and-a-half bathrooms, and an attached two-car garage. Resale single-family homes that were built by Gemcroft have between 1,250 and 1,979 square feet of living spaces with three bedrooms, two-and-a-half to three-and-a-half bathrooms, and an attached two-car garage. The community clubhouse at Legacy at The Village of Fox Meadow offers a great place to get to know neighbors and make new friends. New buyers are eagerly and warmly welcomed by the existing residents. As the community grows, its active adults will have many social events to attend. In the meantime, residents enjoy exploring the surrounding area, which includes five shopping centers, two libraries, and four nature parks. Residents of Legacy at The Village of Fox Meadow have easy access to major highways. Three state routes and Interstate 95 can all be reached within ten minutes. Public transportation is also an easy option: Amtrak and Dart Bus Service both have stations nearby. Residents of Legacy at The Village of Fox Meadow also have peace of mind with five outstanding medical facilities in the vicinity. Newark has a large variety of malls, shopping centers, fine dining establishments, and universities. In addition, there are many recreational and cultural destinations such as the Iron Hill Museum, the White Clay Creek State Park, the Newark Symphony Orchestra, the Pond Performance Center, the Mineralogical Museum, and the Center for Black Culture. For a change of scenery it is only a 15 minute drive to Wilmington, and Philadelphia can be reached in half an hour. Residents of Legacy at The Village of Fox Meadow have access to a clubhouse for small gatherings. Check back soon for more information on the lifestyle in Legacy at The Village of Fox Meadow. Ryan Homes offers two townhome floor plans that can purchased as resale. These attached homes have three bedrooms, two-and-a-half bathrooms, and an attached one or two-car garage. Ryan Homes offers three models for resale that offer between 1,406 to 2,300 square feet of living space. These homes have three bedrooms, two to three-and-a-half bathrooms, and an attached two-car garage. Gemcraft's twin homes can be found as resale only. They are between 2,180 and 3,164 square feet with three to four bedrooms, three-and-a-half bathrooms, and attached two-car garage. Gemcraft's single-family homes are also found throughout the community as resales. There were three models that offer three bedrooms, a den, two-and-a-half to three bathrooms, and an attached two-car garage. I would give a little higher rating but for the fact in order to sell homes faster, the builder was able to change the rules where more than two people can live in a home if older than 18. When I purchased my home, the rules where specific; only two adults could permanently live in each home. I wanted to live in an active adult development, not youngsters (and cars)stuffed in like sardines. Now, there is even a youngster left off by a school bus! Purchased our home with a promise of a clubhouse and pool. Gemcrafts web sight advertised both clubhouse and pool as part of the community amenities. Now were told we won't have a pool and now we have a discrepancy as to the size and furnishing of the clubhouse. We love our house and our neighbors but regret purchasing under false pretenses. Before moving to Village of Fox Meadow we visited many 55 + communities. We decided on the Village of Fox Meadows for many reasons, one was the anticiation of the promised clubhouse and pool. The clubhouse is still not built and we are now told we will not have a pool. We realize that sales people can promise anything to close the deal, but the clubhouse and pool were in many of the advertisements in major newspapers and brochures. We spent extra money to live next to open areas that were nicely landscaped. Since purchasing, the areas are not landscaped and minimally maintained. We love our house and our neighbors but regret purchasing under false pretenses. It is a pure joy to drive up the hill and come home to this community after a day at work. I have had the pleasure of seeing deer, fox , groundhogs, an assortment of beautiful birds, and even a white owl in this neighborhood. Every month brings another activity such as book club, cookie exchange, Fourth of July parties, Christmas parties, etc. This is a very quiet neighborhood of extremely kind and friendly people. I feel blessed to have lived here for over four years. 55places.com is not affiliated with the developer(s) or homeowners association of Legacy at The Village of Fox Meadow. The information you submit is distributed to a 55places.com Partner Agent, who is a licensed real estate agent. The information regarding Legacy at The Village of Fox Meadow has not been verified or approved by the developer or homeowners association. Please verify all information prior to purchasing. 55places.com is not responsible for any errors regarding the information displayed on this website.